Keep your customers coming back again and again! We also offer free card design. Key Tag Style 1: 1.125" x 2.125"
Key Tag Style 2: 1.0625" x 2.875"
Customer retention is a major concern in the retail market today. One of the best ways to implement successful loyalty programs is to use a loyalty card system also called a rewards card. Plastic Card City can handle all of your plastic loyalty card printing needs and help with setting up loyalty card programs. You can download a loyalty card template from the template page and start designing your loyalty program cards. We are currently working on a data sheet that will demonstrate programs through loyalty program examples. 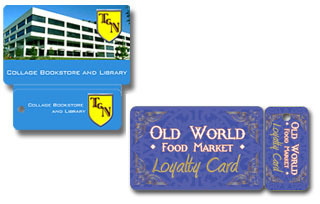 In some cases several family members use a loyalty card program and each might have their own card type preference. Printing multiple cards is expensive so the card with key tag combination solves the problem. Like a plastic membership tag, a loyalty key tag serves as a connection between your establishment and the customer. Printing an eye opening design will enhance the marketing effect of your cards and key tags. Plastic card City offers several services that can help to achieve your goals, from a design service specialist to data and marketing consultants, all with extensive knowledge and experience in card design, printing and marketing methods.